So, you just picked up the latest fitness magazine and read that fasted cardio can help you get leaner. The article you read claims that the body burns more fat while exercising in a fasted state compared to doing cardio later in the day after eating. As a result, you decide to take your morning spin class on an empty stomach, thinking you will burn more fat and build more muscle. But does the science prove this? For years this idea has been accepted as fact by fitness gurus, professionals in the industry, and gym rats. However, it is only half true because it is only half of the story. While it does work and will utilize more fat as energy, it is not an optimal way to train because it breaks down muscles and is ultimately detrimental to building lean muscle mass and balancing hormones. Part of the issue is that we, as consumers, tend to focus on what seems to be working without investigating why it works. There is so much information out there; however, a lot of it is conjecture and not based on scientific fact. It is important to make informed choices, to not accept every article as fact, and not to believe everything the 5% body fat bodybuilder or freak athlete preaches about. When you read an article, it is important to check the sources. It is actually more important than the author itself. Genetics play a role in how our bodies function, and there are some people that get results no matter how they badly they eat or how they poorly they train. Unfortunately, this is not the norm. The point of this article is to demonstrate that fasted cardio is NOT optimal for fat loss, muscle building, or muscle maintenance, since it doesn’t make sense to burn extra fat at the expense of catabolizing muscle. Let’s fill in some educational gaps to learn the science behind this. There are different types of cardio workouts, which affect how the body burns energy and what type of fuel is utilized. Cardio training can be HIIT (High Intensity Interval Training) cardio, low intensity long duration, or moderate intensity cardio. It is generally understood that more calories are potentially burned during exercise sessions of longer duration vs. HIIT. However, even though you burn more calories DURING a session of long exercise, HIIT will burn more calories POST- WORKOUT due to the process of EPOC (exercise post oxygen consumption). This is also known as “after burn.” Therefore, your ability to burn total calories will be more with HIIT because calorie burn continues even after you are done exercising! As a result of more calories being burned, weight loss is more likely. Every activity, from breathing to reaching for a glass of water, requires energy, which comes from calories. We burn calories all day, and even at night while we sleep. We ingest calories as fats, carbohydrates, and protein. Fat yields more energy per gram than carbohydrates because it is much denser in calories. Carbohydrates and protein are only 4 calories per gram while fat is 9 calories per gram. Fat and carbohydrates are the preferred fuel sources for energy, while protein is spared and used for enzyme synthesis and muscle creation. After meals, carbohydrates are readily available in the bloodstream as glucose and can be stored as glycogen in the muscles and liver. Once these glycogen stores are full, the body will convert the excess glucose into fat and store it in fat cells. This is why eating too many carbohydrates can make us fat! There is a finite amount of storage space for extra carbohydrates, while there is an infinite amount of storage space for fat in the body. As a result, all excess energy that isn’t utilized by the body is stored as fat. Proteins are made up of amino acids. The body must ingest 9 essential amino acids to create usable protein for cellular uptake in the body. Think of protein like a chain, and each essential amino acid as a link. If there is a link missing, then the protein is incomplete, which forces the body to break down muscle to get the missing amino acids. Since protein is needed for higher-level functions, it is broken down for energy only as a last resort. Unlike fats and carbohydrates, protein cannot be stored or manufactured in the body, so it is “use it or lose it!” This is the reason why complete proteins must be ingested every few hours. Research shows that protein is only available for synthesis for a limited time. Since everyone is different and all proteins digest at different rates, that time varies from person to person. For this reason, research suggests ingesting protein every 2-5 hours. If you are very active and only eat small amounts of easily digested protein, you will probably need to eat more frequently. In general, a good rule of thumb is to eat protein every 3-4 hours to prevent muscle catabolism. If protein is not ingested during this window, your muscles are broken down into the amino acids the body needs and the unused excess is converted to carbohydrates. If that energy is not used, then the body converts that excess energy into stored fat. A popular misconception is that protein is only needed for building muscle. As stated, protein has many functions in the body, including hormone production, fluid balance, growth & tissue maintenance, nutrient transportation, and enzyme & protein synthesis. According to research, the average male needs 56 grams of protein per day while a woman needs 46 grams. These requirements are higher for people who are athletic. The more intense the activity, the more protein is needed. There are dozens of published opinions on the correct amount of protein that is needed for an active person/athlete. Some claim that 56g for men and 46g for women isn’t enough, and that they actually require at least 50% more protein than that. Others state it should be one gram per .6-1.1 grams of protein per pound of body weight. For example, if you weigh 100lbs and choose to ingest .6 grams of protein per pound, the daily requirement would be 100 x .6 = 60 grams per day. If you are unsure about how much protein to consume, a good starting place is .8g/kg of body weight of protein for both men and women, and for athletes 1.2-1.7 g/kg. The amount of protein that can be used for protein synthesis in the body is debated among articles; however, the theories range from 15- 40 grams per meal. A good guideline to follow is men should aim to eat 20-25 grams of protein per meal per meal and women 10-15 grams. If you feel bloated and full after a meal very high in protein, then it is too much. If the amount of protein you eat does not cause GI stress, then you can slowly increase your protein intake until you reach your goal. However, do not consume more than 35 grams per serving without talking to your doctor. It is important to note that when we exercise, we are never burning just one of these nutrients for fuel; it is always a mix of carbohydrates, fat, and protein in different proportions. To achieve our goal of being lean, we strive to utilize a ratio of more fat, moderate carbohydrates, and minimal protein. When we do an activity that is long term, we can potentially use more fat since we have time for it to be broken down. 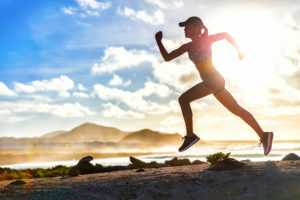 However, when we need to access energy quickly, like when we are sprinting to catch a train before it departs, your body will need to use the fuel source it can access the fastest, which is carbohydrates. Carbohydrates are more readily available than fats during exercise since they are easier to break down into energy than fat. Basically, the body uses the glucose in the blood and breaks down the glycogen stored in the liver and muscles. Once the body has depleted its stores of glycogen, it will tap into fat stores and convert fat to glucose. This is where the idea for fasted cardio originated. When you wake up and have not eaten, your blood and stored glycogen are low, which forces the body to start to burn fat during exercise. Many diets teach the widespread formula, which states that 3500 kcal equals one pound of fat. Often, dieters strive to decrease their calories accordingly while trying to lose weight. Unfortunately, frequently people mistakenly assume that when their Fitbit states they burned 3500kcal, that this was exclusively fat loss. It is important to understand that a pound of body mass was lost, not just fat, which is a big difference. The goal of dieting and exercise is not to lose weight. It is important to lose the CORRECT type of weight, which should be predominantly of fat. People are so obsessed with caloric intake focused diets that they neglect the types of foods they eat and the nutrients contained in what they ingest. It is more important to eat in a way which will create a hormonal environment optimal for fat loss. When you eat carbohydrates, you secrete insulin, which will negate your ability to utilize fat stores optimally. If you keep eating carbohydrates all day, you are telling your body to use those carbohydrates for energy. By eating a diet consisting of complete proteins, healthy fats, and low carbohydrates, all while meeting your micronutrient and phytonutrient requirements, you will create an environment ideal for fat loss, muscle building and/or maintenance. What Happens During Fasted Cardio? Basically, the reasoning behind fasted cardio is that if carbohydrates are needed during cardio, then after an overnight fast, the body will need to convert fat to carbohydrates when carbohydrate sources are depleted. The process of converting fats to carbohydrates requires energy from the body, and thus burns extra energy. Therefore, the theory is that a person can burn more calories and use fat as a source of fuel in a fasted state. The only problem is that muscle loss is not factored into this equation. Exercise is considered a type of stress, and we need energy quickly when the body is stressed. Additionally, exercise independently requires energy for movement, plus cortisol is secreted at times when we need energy. Therefore, we have increased cortisol levels during times of exercise. Cortisol stimulates gluconeogenesis, which allows the production of glucose (the building blocks of carbohydrates) from sources other than carbohydrates. It also increases free fatty acid blood levels, minimizes glucose utilization for the body, and saves glucose for the brain, since glucose is the only energy source utilized by the brain. So far, cortisol seems great! However, it also increases protein catabolism, which means it breaks down muscle tissue. The body starts to metabolize protein in times of stress because it thinks it is in a survival situation (fight or flight is the nervous system response), and the muscular system, immune system, and digestive system all need protein to function. This is the exact opposite of what we want to do! We need to preserve muscle, because the more muscle in our bodies, the higher our metabolism and the better our ability to burn calories. People with more muscle mass have higher metabolic rates since it takes more fuel to move a bigger machine. The main goal of exercise and healthy dieting is to increase our metabolism to lose weight. Since we can only burn so much fat during exercise, building muscle is extremely important during weight loss. If your exercise is depleting your muscle tissue and therefore decreasing your metabolism, does it make sense to do fasted cardio? Another negative effect of breaking down protein is that it may create an acidic environment in our bodies due to the creation of ammonia during protein catabolism. Research has shown that an acidic environment promotes inflammation, disrupts hormones, and makes a person more likely to get sick. In modern society, cortisol is secreted during psychosocial stress instead of a survival situation, which is detrimental to our bodies. Our body is then working to create extra energy when we don’t need it. For example, your cortisol may spike when you are sitting at your cubicle and racing to finish your work for a deadline. There are two negative issues that may arise by being in a constant state of stress with excessive cortisol. First, during this state of catabolism, people under eat, which causes them to lose lean muscle. Second, the catabolism decreases metabolism, so even if the person eats the same amount as usual, they will gain weight because they are not burning the calories. The body is conserving the calories for the times of stress. Most often there is a lack of protein intake, which causes the muscle to break down to fuel the body with the amino acids it needs. Recent research has shown that this is exacerbated due to imbalances in the hormones leptin and ghrelin, which cause people to overeat and gain weight. Again, as mentioned, each person is different. The take-home message is that your hormones need to be controlled in order to properly fuel your body and control your weight. So yes, fasted cardio will burn more fat, but it does so at the expense of burning muscle. The solution is NOT to truly fast before you work out, and to make sure that you include a protein source as soon as you wake up. Ideally, it is best to consume protein 30 minutes prior to working out, but as long you do not eat within 15 minutes of a workout, your body will reap the benefits. Men should consume about 15 grams prior to a cardio session and over 20 grams for weight lifting, while women should consume about 10 grams prior to cardio and over 15 grams if lifting weights. For those trying to build muscle or doing extended intense cardio bouts, branch chain amino acids (BCAAs) should be consumed 45 minutes into the session. BCAAs are the essential amino acids that the body needs for cellular function and muscle tissue preservation. They will help prevent any catabolism of muscle tissue during training sessions. By following these guidelines, you will not burn through your muscle tissue for protein. You can then reap all the benefits of fasted cardio by utilizing more fat for fuel, while avoiding all the cons, such as high cortisol levels and muscle breakdown. The end result will be building lean muscle and burning fat while increasing resting metabolic rate. Bushman, Barbara A., PhD. “ACSM’s Resources for the Personal Trainer Fourth Edition.” ACSM’s Resources for the personal trainer: Medicine & Health Science Books Wolters Kluwer, 2014. Brooks, G.A., Fahey, T.D., & Baldwin, K.M. Exercise Physiology: Human Bioenergetics and its Applications. 2005. Bilsborough S, Mann N. “A review of issues of dietary protein intake in humans.” International Journal of Sports Nutrition and Exercise Metabolism. 2006. Wilson, J., & Wilson, G.J. “Contemporary issues in protein requirements and consumption for resistance trained athletes.” Journal of the International Society of Sports Nutrition, 2006. Tipton K.D., Wolfe R.R. “Protein and amino acids for athletes.” Journal of Sports Science. 2004. Eberle, Suzanne Girard. “The Body’s Fuel Sources.” Endurance Sports Nutrition, Third Edition. 2014. Bohè, Julien, Low, J.F Aili, Wolfe, Robert R., & Rennie, Michael J. “Latency and duration of stimulation of human muscle protein synthesis during continuous infusion of amino acids.” Rapid Report. April 2001. Research has shown that training the nervous system with Olympic lifting, plyometrics or any type of explosive high intensity training can be beneficial to the athlete when done correctly. There is much debate on the subject of CNS (central nervous system) fatigue and whether it is a real phenomenon or a false naming of adrenal fatigue, muscle fatigue, etc. Whether or not CNS fatigue truly exists or is being named correctly is beside the point. The fact is that explosive exercises with weight such a Olympic lifting place very high demands on all systems of the body and carry serious risk of injury if not learned and practiced properly. Olympic weightlifting requires a high level of understanding and skill. Bompa has a suggested that the optimal number for training the nervous system is 1-3 repetitions with a rest period of 6 minutes between sets. In addition ATP is only present for 6-8 seconds which is about 3-5 reps before needing at least 2-3 min of recovery. Once ATP runs out the lifts will become compromised because the muscle does not have the energy to elicit the contraction the nerve is demanding. Anything beyond said rep range starts to overload the joint because form is compromised. Since these methods are designed to tax the central nervous system it does not make sense to try to change them into strength and endurance movements for high reps. Despite the research and proven science many mainstream programs will suggest doing a set of anywhere from 10-20 repetitions or even do as many reps as possible in a 30-60 second window. Using these methods for endurance is like telling a sprinter to sprint through marathons for training. The other issue is that these methods require a very high level of motor control. Proper movement patterns need to be practiced without resistance at a low level until the client shows proficiency in the movement. Of all the lifting methods, Olympic lifting is the most difficult to master because of the required flexibility and motor control for explosive movements with heavy weights to get the max benefit. Olympic lifting is a sport in itself and can take years to learn. From our experience it takes the average person 4-6 months just to be able to get into the positions required to properly perform the movements. Once they can move it can take another 6-12 months to actually learn how to correctly do the lifts with weights. Olympic lifting is a professional sport yet everyone thinks they can do it without training. Even professional athletes should be cautious because the lifts were designed not for football, soccer or tennis, but for Olympic lifting. Athletes should integrate Olympic style lifts into their strength and conditioning programs to reap the benefits of these movements but not duplicate them exactly. I suggest most athletes train from the power position which is called the hang (bar just below knees) since that is what most sports require. If a super elite athlete wants to learn the full lifts, it should be determined by a very high level coach. Most courses that teach this method are 2-4 days and then a certification is received allowing one to teach the lifts. Since we all agree Olympic lifting is just like basketball or any other pro sport, then how is that possible? One cannot learn basketball in 2-4 days, let alone teach it, right? The answer seems obvious, yet people still spend millions on extreme home training videos and going to training facilities to do trendy high intensity programs that make no scientific sense. Training tennis players requires a multidimensional approach that includes strength and conditioning training as well as the sound principles of injury prevention. Tennis is a sport that requires a lot of repetitive movements and full range of motion in every joint. The goal of this program is to discuss proper biomechanics, importance of flexibility, outline proper training techniques and how nutrition affects performance. It is important to evaluate the body as a whole to detect weakness and any joint dysfunction. To avoid overuse injuries screening for muscle imbalances is an extremely important part of any training program. The rationale behind it is that there are detectable and correctable abnormalities of muscle strength and length. These imbalances can affect basic movement patterns such as running or swinging a racket and lead to unexplained musculoskeletal pain and dysfunction. Once detected, a specific functional rehabilitation program can be implemented. This can include but is not limited to soft tissue release, corrective exercises, core strengthening through tri-planar movements, and balance and flexibility training. The focus is on restoring function and stability by correcting irregular muscle patterns and treating the body as a whole. Flexibility and balance are the two most important concepts to build a solid foundation. Moving incorrectly will hinder the body’s ability to create maximal force which will undoubtedly affect your game and workout. Repetitive incorrect movements actually shut muscles off and create synergistic dominance, reciprocal inhibition and altered neurological pathways which will greatly inhibit your form. Tight muscles cause compensation patterns that will disrupt proper movement and hitting mechanics. Proprioceptive neuromuscular facilitation (PNF), active and dynamic stretching should be part of your program. We find that most athletes move incorrectly due to poor flexibility and balance. Most tennis players have very tight hips, shoulders and pecs. You need to stretch just about every day especially after a match or practice. If you do not stretch you will have a short lived career riddled with injuries. Core training needs to be specific to tennis and should include balance and proprioceptive exercises. Sit ups, bicycles and leg raises should be eliminated totally from a tennis program. According to research these types of exercises further tighten the hips which are already prone to tightness. These floor exercises also put tremendous torque on the spine irritating disks and do not recruit as many abdominal muscles as you might think. Athletes do not play tennis lying down on their back, so why train that way. Training should include core stabilization and tri-planar exercises that mimic movements specific to tennis. Training with medicine balls and using chopping motions with balance devices are a good idea. The core is the center of all movement so it should be trained in a way that is optimal for each individual. Building a strong core creates a solid base for supporting your body through specific movements. A weak core will increase the risk of injury and can lead to loss of power on the court. You need to set up the training environment that challenges balance and proprioception specific for tennis players. Implementing cuing exercises will improve motor skills and promote proper movement patterns. Poor balance and flexibility create wasted movements and will inhibit the body’s ability to decelerate properly and change direction explosively. This is the most overlooked aspect. All athletes can benefit from strength training and should do at least 2 days a week even in season. The exercises should relate directly to tennis and incorporate full body movements targeting weak links. You should be training using multi sets mixing resistance with endurance training. It is crucial to train at a high velocity since tennis is a fast sport. You need to establish core strength and proper movement patterns before moving onto plyometrics and explosive exercises. Plyometrics should be added only after a full body movement analysis is performed. Too many times athletes do plyos without being able to move or absorb force properly. Most of your cardio and endurance training should be on court since that is where you perform. Running 5 miles has little benefit to a tennis player since the court is only 78×28. Interval training should be the staple of your program. Ex. Set up cones on a tennis court or measured area and have athletes run to the cones and explosively change direction while rotating. It would not be a bad idea to do a 30-40 min weight session and then play a practice game. This method can be effective for endurance strength because in a real game you are never doing prior weight training. This method is called pre-exhaustion. Riding the bike doesn’t make you better on court either. It is ok for a cool down or an infrequent change of pace but should by no means be substituted for court work. You stand during tennis so why sit when you train? You should not even sit between points. You should be training according to time. The average 3 set mens match is about 2 hours but a 5 set match can be up to 5 hours. There are short rests of 10-15 sec between points and about 120 sec between sets. An average point is about 15 sec but can go longer. If you play multiple opponents at a tournament Juniors have a minimum 1 hour rest but it can be longer depending on length of previous match. So it is important to train in the same time frames that the game demands. Would it make sense for a boxer to train 2 min rounds and 1 min rest, when a round is 3 min with 1 min rests or to only do 2 or 3 rounds in training sessions? Running and most cardio is aerobic so training that way limits carryover greatly. Research proves that too much aerobic activity is actually detrimental to sports training. During this time you need to stretch and rehydrate with carbs to replenish glycogen stores and some protein (BCAA). Gatorade in any form is not recommended, drink something with natural electrolytes and carbs. Zico makes coconut water which has more potassium than 10 Gatorades. An organic protein bar or some type of easily digested form and fruit is a good idea for long days. At Pure Fitness, we believe that restoring optimal function is the most important concept in eliminating pain and preventing injury. With the combination of our evaluation, treatments and structured program, tennis players will find improved performance and playing satisfaction. Many parents focus on helping their child reach their full academic potential, with tutoring, homework, and structure. Children have an athletic potential as well that is often overlooked, or thought that team sports alone will help them reach it. While I don’t discount the importance of learning teamwork, team sports alone will not help a child reach that potential. If they excel at a sport or sports, getting them involved early in strength and conditioning training can mean the difference between playing at the varsity level, possible college scholarship, or reaching the dream of professional sports. For some parents strength training may seem risky and unnecessary for their child. As a kid I was always told, “You play sports so you’re already in shape.” Or one of my personal favorites “if you want to get stronger just go do pushups and sit ups.” These commonly heard statements are absurd and could contradict the sport specific goals of nearly all sports. One thing that trainers, coaches, and parents should know is that children and adolescents are not just small adults and need a training routine specifically designed for them. Children and adolescents are physiologically different from adults, but this doesn’t mean that with the PROPER training that they cannot benefit greatly from strength training. With the aid of resistance training, boys and girls are capable of significantly increasing muscular strength in addition to their natural growth and maturation during development. Studies have shown that with the proper intensity and volume, children as young as 6 years old have benefit from resistance training. Like sports, there is no minimal age requirement to participate in strength training. How can strength training affect children and adolescents? First and foremost, for children and adolescents, trainers must find a way to make training FUN as well as beneficial. The concept of training can be intimidating. Some children and adolescents look at strength training as work, and that’s exactly what it is. Making up games/competition to incorporate into exercise programs can help keep the trainee engaged and excited to work hard. So therefore, training children and adolescents has that added dynamic that requires some extra attention and focus by the trainer to ensure maximum gains/improvements and to inhibit frustration/boredom. Another important aspect of training children and adolescents is language and communication. Using appropriate words and tone can help encourage a trainee and maintain self-esteem; inversely, using too harsh a tone or using too strong or negative language can damage self-esteem. If a child has low self-esteem and gets frustrated with exercise the odds of them working at 100% is low. A trainer should ensure that there is not a negative correlation between exercise and satisfaction and self-worth. Educating children and adolescents on the benefits of strength training and how it can make them feel better, live better and be happier will only help promote healthy living. In adolescents, puberty is when we see a substantial increase in muscle mass (hypertrophy), and for most people this increase in muscle size is associated with an increase in strength and signifies the turning point at which training can begin. Although this could be one view, neurological adaptation (nervous system development) is the main contributor for pre-pubescent children. This helps with motor development and coordinated movements, illustrating how our athletic development is started even younger. For example, throwing a baseball or catching a football requires an extremely high level of coordination and motor skills. It should be looked at as a fundamental foundation to help aid in proper athletic movements later in life. The main concern of training a child or adolescent is not only making significant gains, but also ensuring the safety of the trainee. Whether it’s a trainer, coach, or parent that is working with a child or adolescent trainee supervision is very important. Form and posture mistakes can be most detrimental to a new trainee of all ages and can ultimately lead to poor mechanics and/or injuries. The proper biomechanics of an exercise can greatly benefit children and adolescents. Taking the time to advise proper form and movements should be the first priority to any new exercise. Sometimes it is easier to master the technique of an exercise with little or no weight added. This will ensure that the proper movement patterns can be instilled with the program. A person that is training at any age has some potential of injury. Proper training significantly decreases the risk of injury but cannot guarantee an athlete won’t get injured, just as an athlete could be injured in the heat of competition with any sport. What proper training does guarantee is that the injury potential in competition will reduce dramatically. Functional sport specific training will allow for identification of weaknesses and subsequent increase in balance, flexibility, strength, and coordination in vulnerable positions and movements. This leads to an overall increase in strength and ability to perform in the athletic arena. Regardless of the individual, when introducing resistance training it is always important to underestimate ones physical abilities regardless of how big or strong the child or adolescent may seem. For most children and adolescents, resistance training will be a new experience, and pushing and exceeding their abilities too soon may put them at a greater risk of injury. Starting slowly and cautiously to complete an evaluation and moving up when the foundation is established is the safest approach. Should trainers worry about growth plate injuries in children and adolescents? Growth plates are areas of bone that is still in development. The growth plates are cartilage tissue at the ends of long bones and are important to normalize the length and shape of mature bone. Growth plate fractures can be classified depending on the degree of damage to the plate itself. All children that are still growing are at risk and the injury rates increase into adolescents. Growth plate fractures occur twice as often in boys then in girls (this could be due to boys having higher involvement in high impact sports). 1/3 of growth plate injuries occur in competitive sports, such as basketball, football, and gymnastics. 1/5 of growth plate injuries are due to recreational activities, such as skateboarding, skiing, biking, and sledding. There are five different classifications of growth plate fractures. A type I fracture is a break in the bone that separates the bone end from its shaft; this type may require surgery which involves pins. A type II fracture is when the bone breaks partially through the growth plate and partially through the cortical bone itself; this is the most common type of fracture. Type III fracture is a break off of a portion of the growth plate and piece of the end bone; this type is more common in older children adolescents. Type IV is a break through the bone shaft, growth plate, and end of the bone; these fractures commonly stop bone growth and are treated with surgery. Type V is when the growth plate is compressed due to a crush impact; this type will almost always disturb bone growth but is very rare. There are two major reasons for these types of injuries. First, in children and adolescents, bones and muscles develop at a different speed so the bone may be weaker than the ligament tissue that it is connected by. The second reason for these injuries can be attributed to high impact movements on the bone such as; falls, contact sports, or high rates of joint stress. For trainers there has been an increasing concern for these injuries, especially with plyometric workout programs. Plyometric workouts can be best defined as exercises that involve rapid stretching and contracting of muscles to gain an increase muscle power. Even though there are limited studies on plyometric workouts in regards to children and these exercises there’s an increase concern focused on the high intensity impacts with plyometric exercises. The major concern within plyometric workouts has focused on the intensity of depth jumps. The depth jump is rated as the highest intensity of all plyometric workouts because of the amount of stress it puts on the lower extremities. The proper mechanics of a basic depth jump consists of jumping forward off of a box on the ground with both feet. Then rapidly descending into a squat position and exploding in the upward direction with a powerful jump. The height of the box that is descended from will determine the amount of impact within the exercise. A child that has experienced a growth plate injury may have some visible deformity. Another telltale sign of a growth plate injury is consistent or severe pain at the joint. If the child is unable to move or put any degree of pressure without experiencing pain then there could be a growth plate issue. If any of these sign are apparent while training a child, then the trainer should immediately stop the session and should inform both the parent and child to get an examination by a licensed physician (trainers are not licensed physicians and should never diagnose a trainee). Bone mineral density (BMD) and bone mineral content (BMC) are very important in a maturing body. Bone mineral content refers to the amount of bone mineral in grams. Whereas, bone mineral density refers to the grams per centimeter squared (g/cm^2). Children are considered “moving targets” and bone mineral content may not apply to them the same way it does to an adult (heavier bone may not reflect stronger bone). The age at which bone mineral content will most likely reflect bone density is post-adolescents. Bone mineral density is most advantageous to the strength of children and adolescents bone make-up. The most crucial time for development and strengthening is between the ages of 10-15 (for most this is adolescents). Bone mineral density can be developed by performing weight bearing activities. The more vigorous the activity or exercise is the greater the increase in bone strength (BMD). This may seem to contradict the theory on growth plates, and it does. This is why children and adolescents are not miniature adults. There is an overlap in performing more intense exercise as children and adolescents because of the risk of growth plate injuries. Keeping the trainee in a healthy intensity range will help benefit the child without injury. Medium to high intensity plyometric workouts can be safe for a child to maximize healthy bone strength. There seems to be a simple solution to this concern with children and adolescents, and that is to avoid this particular plyometric exercise or any workout that can put a high level of stress on joints. There are plenty of resistance training exercises, including plyometric exercises, that children and adolescents can do without over stressing their joints such as most power lifts, most strength training lifts, repetitive jumps, bounds, different throwing exercises, etc. Some times as trainers, we focus more on what we can’t or shouldn’t do in regards to training children and adolescents and inadvertently forget what we can do. There are far more exercises that are safe for children and adolescents then ones that are not. Some other important factors to keep in mind for training children and adolescents are nutrition, proper recovery times, and educating youth sport coaches about the benefits of strength and conditioning training. The facts are that the drop-out rate for dieting is 99%. Dieting alone is proven ineffective for long-term weight loss. Resistance training is by far the most efficient form of exercise for long-term weight management because it changes your body’s energy needs and combats one of the biggest challenges with stand-alone dieting which is that frequently you lose muscle mass along with the fat, which in turn reduces your body’s energy needs. The fact is that muscle burns fat and the more muscle you have the more fat you burn. This is true even at rest. With appropriate resistance training you can maintain and even increase your lean body mass as you lose fat which ensures your fat loss success for the future. Cardiovascular training helps your body spend your fat stores and aids glucose tolerance. This training is the most overdone and misused aspect of exercise. The common myth of doing cardio before beginning a weight training program is absolutely incorrect. Weight training should be the staple of your program and cardio, done properly, should be the compliment. Interval Training helps you burn more calories during and after your workouts. It also dramatically improves your cardiovascular capabilities. Mixing bursts of high intensity work with low intensity periods of recovery overloads both the aerobic and anaerobic systems and provides the benefits of both aspects of training simultaneously. If you answered no to any of these questions, then your trainer may be lacking key knowledge that is necessary for you to reach your fitness goals. More importantly, your trainer may be doing you more harm than good. It is simple for a trainer to deceive an unsuspecting client into believing they are knowledgeable. This is due to the general public not being educated about the fitness industry and trusting a gym will provide them with a competent trainer. In most cases, gyms are not always concerned with the quality of the people they are hiring. If a gym thinks a trainer possesses strong sales skills, they will hire them as long as they have some type of certification. A qualified fitness professional will understand at the very least everything listed above. Remember when hiring a trainer to make sure they are a full time professional. Part time does not cut it when it comes to your health. Would you go to a part time Medical Doctor? Eat a healthy snack before going out to dinner, so you do not arrive at the restaurant famished and then overeat. Drink a glass of water before the meal and continue drinking water throughout the meal. Do not eat the bread on the table before the meal. Request that it is removed from the table or place it out of arm’s reach. To start the meal, order a salad (with non-creamy dressing on the side) or a broth soup. Do not order fried or breaded foods. Share your appetizer or entrée with a friend. Alternatively, cut your portion in half and ask for the second half to be brought home in a doggie bag. Ask for extra vegetables instead of rice or potato. Ask questions about how items are prepared. Choose foods that are baked, broiled, roasted, poached, grilled or steamed. Stay away from items that are sautéed, cooked with cream or butter, scalloped, au gratin, Alfredo, or batter dipped. All sauces and condiments should be ordered on the side. Reduce the amount of cheese in the meal. Limit alcohol consumption. If you are drinking, make sure to drink plenty of water with a goal of 2 glasses of water for every alcoholic beverage. For lunch, choose whole-grain or whole wheat bread. Choose lower calorie meats, like turkey, chicken, and lean cuts of ham and roast beef. Ask for less meat and more vegetables. Use mustard, vinegar and low fat dressings rather than mayonnaise and oil. If you must have cheese on your sandwich, limit it to only one slice. For breakfast, choose Greek yogurt, oatmeal, eggs/egg whites/egg substitutes, non-sugar-high fiber cereals, fruit, and protein shakes. When splurging, remember that pancakes with syrup have one third less fat that French toast or a Belgian waffle with whipped cream and fruit. Drink tea to feel full sooner and slow down your meal. If available, choose a lunch-sized portion. Choose a soup as an appetizer. Egg drop soup and hot and sour soup are about 100 calories/cup. Eat plenty of fruits and vegetables, and select fruits and vegetables with a wide variety of colors. Select a chicken, shrimp or vegetable dish instead of a noodle or rice dish. Ask for brown rice instead of white or fried rice. Ask for twice as much veggies and half as much meat in your entrée. Order steamed dumplings rather than fried. Don’t eat the fried noodles!!! Avoid the breadbasket, especially the garlic bread. For appetizers, choose minestrone, insalata, bruschetta, and roasted peppers. Select marsala, arrabiata and piccata entrees instead of scaloppini, pesto, or parmigiana. Avoid casseroles and cream filled pastas. When ordering pasta, only eat half. Choose marinara-based pasta dishes or red or white clam sauce. Go light on the cheese. Do not add extra cheese! Choose a thin crust when possible. Choose pizza with red sauce instead of cream sauces. Watch your sour cream, guacamole, and cheese. Limit fried tortilla chips and nibble on tortillas instead. Use salsa, which counts as one serving of vegetables. It is loaded with fiber. Oats are a great source of selinium and boosts immune system. Oats absorbs the LDL cholesterol, so called ‘bad’ cholesterol and flush it out from the body. It also cures constipation and stabilizes blood glucose level. It is low in fat and salt and can be a great food for morning breakfast. Have a good breakfast of oatmeal will keep you going for hours while burning your belly fat at the same time. Oatmeal will last in your stomach for a good length of time, preventing your blood sugar levels from dropping. You will find no need for snacks then. Saying this though, do not choose the oatmeal which is already flavored and sweetened. Sweeten it yourself by sprinkling it with blue berries, strawberries, and other naturally sweet berries. It is a berry good idea to eat lots of berries when you are trying to burn the excess fat around your abdomen. There is a lot of fiber in something so small. Raspberries, cranberries, blackberries, grapes, acai berries, strawberries and blueberries are fantastic. There is 6 grams worth of fiber in one cup of raspberries. You can sprinkle them on your oatmeal breakfast, or make a berry smoothie to drink for your breakfast. You will go nuts over this suggestion. Nuts! They are very good for burning the fat round your midriff. How do they slim your tummy? They slim down your tummy by keeping it full. This fact was proven by a local university, who proved that persons who ate nuts felt fuller for much longer than people who were eating rice cakes. You only need 24 Almonds a day to keep away the hunger pangs without piling up on the calories intake. There are now so many diets where almonds are a key factor in the diet, be it in salad, on breakfast as a snack that almonds are more popular now than ever. There has been a survey conducted in an American university regarding weight loss. People who ate Watermelons regularly lost a lot more weight than those who did not eat the watermelons. It was discovered that the watermelon was having a large effect on the plaque that builds up in the arteries because apparently it changes the effect of blood lipids and prevent belly fat build up. In the study, the students who ate watermelon instead of keeping hydrated with water found that their body weight dropped further than the water based diet. If you are fishing for a good belly fat burner. Fish is what you need. Meats and fish work very well to burn fat. The leanest meats available is Turkey, but if you wish to cut down either further then choose fish for your meal. Tuna and Salmon are perfect fish for your meals as they contain Omega 3 fish oils which are also good for your brain and they help to increase the anti-stress chemicals which will decrease your belly size. Do be careful of cured meats as they tend to contain saturated fats. It is an essential diet. The vegetable salad is good for health and make for great fat burning foods, plus when you are busy with work they are also quick and simple to prepare. It should consist of cucumber, carrot, spring onion leaves, avocado, onions, boiled mushrooms, green beans, peppers and cauliflower without cheese and mayonnaise. Also have a stick or celery in the fridge, so that if you want a snack in between meals then you can snack on a stick of celery and you will not gain weight. Tomato soup is very nutritious. It is one of the best foods that burn belly fat and prevents you from over-eating and loose excessive weight. It is packed with vitamin A, calcium, iron and fiber. All these help in burning fat and increase metabolism. It also prevents the risk of heart disease. It is filled with Omega-3 amino fatty acids, improves metabolism and burning of more fat. It helps the body to fight against diseases. Although being meat, it contains proteins that is easily digestible and contains low fat. It contains iron which is helpful for creation of red blood cells. If the body has more red blood cells it can take more oxygen thereby and thereby metabolism increases. It contains a lot of antioxidants mainly catechins, which scavenges free radicals from the body. It also contains epigallocatechin-3-gallate which reduces blood levels of low density lipoprotein (LDL) cholesterol which forms block in artery walls and thus prevents cardiovascular diseases. The polyphenols in green tea dissolves triglycerides and helps in fat loss. These are soybeans which have been lightly boiled and salted. They are excellent source of vitamin C, vitamin A, folic acid and fiber. They do not contain saturated fats, and also dissolves unwanted fats. Olive oil is great oil as it is able to control hunger. It is rich in antioxidants and should be used for cooking. It has high proportion of monosaturated fats which is easily digestible and increases metabolism without piling transfats in the body. Another advantage of this oil is that it keeps your cholesterol levels down and stops you craving for more food. Everyone forgets the most natural ingredient of your diet to help you lose weight and that is water. If you drink half a pint of water before you eats a meal, you will find that it will fill your stomach up so that you are not able to eat as much food. Keep topped up on water throughout the day. Not only does it help you to lose weight but it also helps to clean your digestive system and also it will help with the proper digestion of your food, hence the burning of your body fat. Use your noodle when it comes to a more natural diet. Kelp noodles are a natural way of eating your favorite food and losing weight at the same time. Kelp noodles are made from seaweed and only have 6 calories to their name. You eat them raw and you will find that they are very rich in minerals. Gatorade has long been a popular sports drink, especially for kids. It is marketed as an electrolyte replacement drink for athletes. Electrolytes are substances that contain free ions and conduct electricity1. In the human body, electrolytes are responsible for regulating nerve and muscle function, blood pH, hydration, blood pressure, and damaged tissue repair1. Some examples of electrolytes that are in our bodies are sodium, potassium, magnesium, and chloride1. The levels of electrolytes in our blood change when water levels in our body change, for example, during altered hydration status1. When we sweat, we lose mostly sodium and potassium, and they must be replaced in order to maintain the proper balance in our bodies1. According to ACSM, two pounds of sweat contain an average of 800 mg of sodium (ranges between 200-1600 mg) and 200 mg of potassium (ranges between 120—600 mg)2. Gatorade has three different lines of sports drinks: G2, Gatorade Protein Recover, and Gatorade Thirst Quencher. All Gatorade products have a list of difficult-to-pronounce-ingredients, and many of these ingredients are forms of sugar or artificial sweeteners. In fact, sugar is the second ingredient after water; the ingredient list on a food label lists the ingredients in descending order of prominence and weight. Therefore, Gatorade products are mostly sugar and water. In fact, Gatorade Thirst Quencher has a whopping 14 g of sugar, coming mostly from sucrose syrup and glucose-fructose syrup. “The American Heart Association recommends that no more than half of your daily discretionary calorie allowance come from added sugars. For most American women, this is no more than 100 calories per day and no more than 150 per day for men (or about 6 teaspoons a day for women and 9 teaspoons a day for men)3.” This is about 24g of sugar for women and 36g of sugar for men. Excessive sugar in the diet can be very bad for your health, and it is important to try to limit the amount of added sugar in your diet. Sugar that is naturally occurring in fruit and milk is perfectly fine; it is the added sugars that need to be decreased. Consumers need to beware because sugars are hidden in many different kinds of foods, such as salad dressings and crackers4. One negative consequence of excessive sugar intake is weight gain and obesity. Sugar is very calorie dense, and as stated before, it is added to numerous foods and drinks4. Additionally, eating a lot of sugary foods displaces more nutritious foods in the diet, and these foods don’t provide the same satiety as healthful foods, and therefore cause overeating4. A second issue with added sugars is that they increase the risk for higher triglycerides, lower HDL, and higher HDL, which contribute to an increased risk of coronary heart disease4. Lastly, sugar contributes to tooth decay4. Another huge problem with Gatorade is the amount of food additives and colorings added to the products. For example, one additive is monopotassium phosphate, which is not only used as a food additive, but also a as a fertilizer and fungicide7. It is a bit scary to be ingesting an ingredient used to fertilize plants. Additionally some flavors of Gatorade contain brominated vegetable oil (BVO), a food additive used as an emulsifier in drinks with citrus flavoring10. Bromine – part of BVO – is an element found in flame retardants9! Some research shows that it may build up in the body leading to thyroid problems, memory loss, and skin and nerve problems9. It has been banned in Japan and Europe10. In January 2013, Pepsico announced they had plans to remove BVO from Gatorade; however, there are no current plans to remove it from Mountain Dew10. Many popular athletes endorse Gatorade and some may use it to replace electrolytes during sporting events and training. Gatorade isn’t completely bad; it does replace sodium and potassium and help restore electrolyte balance and hydration status. Athletes are paid to endorse products, and they may not do their due diligence to find better and healthier alternatives.